We encourage your support, donations, fund-raising events and promotions on behalf of PAWSitively Curing Cancer, Inc.
Trimline Manufacturing is proud to be the Founding Corporate Sponsor of PAWSitively Curing Cancer, Inc. The Trimline soft collar is a sensible substitute to the hard plastic collar, and is available at your local veterinarian in six sizes to accommodate all cats & dogs. 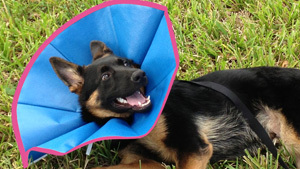 For every soft recovery collar sold, Trimline Manufacturing will donate a portion of its proceeds to PAWSitively Curing Cancer, Inc.
PAWSitively Curing Cancer, Inc. is a 501(c) (3) non-profit organization dedicated to raising funds for pet cancer research. Cancer is the number one disease in dogs and cats. It shortens their lives and takes these wonderful pets from the children and families who love them. PAWSitively Curing Cancer, Inc. is dedicated to raising funds from caring businesses and families with the goal of finding a cure for this deadly disease affecting the dogs and cats who add so much joy to our lives. All proceeds from PAWSitively Curing Cancer, Inc. will be donated to the University of Florida College of Veterinary Medicine for pet cancer research. Web development by: J&L Information Technologies Inc.